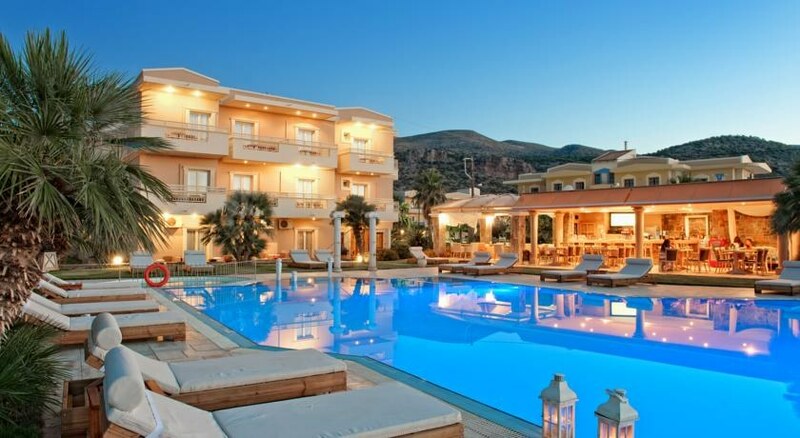 The Socrates Hotel Apartments and Studios are located on the coastal road between Malia and Stalis on the delightful Greek island of Crete. 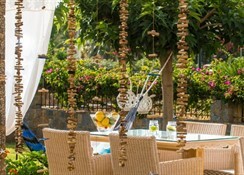 Within walking distance of the towns and beach, the Socrates Hotel Apartments consist of tastefully decorated self-catering apartments and studios for couples and families, and are an ideal affordable base for an independent holiday on Crete. There is an inviting pool and terrace surrounded by lawns, separate children's pool and playground, and the convenience of a restaurant/bar and snack bar onsite. For a tranquil and friendly resort in which to relax, book into the Socrates Hotel Apartments and explore the many nearby attractions and activities. Getting to the hotel: 28km to Heraklion International Airport. 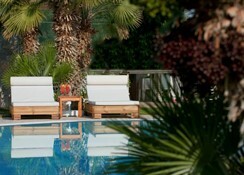 Local tips: The hotel is a 5-minute walk to Malia town centre and 10-minute walk to Stalida town centre. It's 150m to the central beach; and 3km to the archeological attraction of Malia and 2km to Malia Palace. 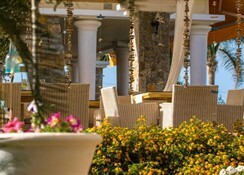 Food, drink and entertainment: Main restaurant and bar, pool snack bar, pool bar, satellite TV lounge, and snack bar. Sport, games and activities: Outdoor swimming pool, sun terrace and lawn gardens, sunbeds, parasols & towels, table tennis, table soccer, pool/billiard table, there are water sports kiosks with full information at Malia and Stalis beaches; and access to external diving, snorkeling, cycling, boat trips; Crete Aquarium at Gouves (north coast); Anopoli water park & Aqua Plus in Hersonissos. For the kids: Children's swimming pool, and playground. Additional: 24 hour Reception/Front Desk Services, Beach towel service,housekeeping, room service (to midnight), Doctor (upon request), travel desk, WiFi internet access, Internet corner (at extra charge payable locally), fax & copy service, car & motorbike rental, beauty treatment (on request), parking allowed, and pets allowed. Guest studios and apartments with sea, pool or garden views and access to an outside Jacuzzi have a tasteful decor of soft neutral colours, light wood furnishings, and modern amenities for your comfort. Features include a private furnished balcony/terrace or veranda, individually-controlled air-conditioning(at extra charge payable locally), private bathroom with bathtub/shower, hair dryer and amenities, WiFi high-speed internet access & ADSL internet connection, a fully equipped kitchenette, fridge, kettle, sitting & dining areas, satellite TV with sports & movie channels, direct dial telephone, safe box(at extra charge payable locally), iron & board, and coffee facilities. Studios with 2 and 3 beds are available; apartments with 3 beds have an extra bedroom, 4 and 5 bed apartments have 2 extra bedrooms.